After a decade of being a Verizon customer I have grown to dislike them. Their coverage is the best of all 4 carriers in America. It is the ONLY provider that actually has usable service at my home. Sprint, T-Mobile, and AT&T either have no coverage of so many dropped calls as to be unusable. That made searching for Verizon Alternatives via an MVNO, third-party companies that buy “air time” from the 4 major carriers in bulk, easier. After some research I found Total Wireless to be a decent option. After working with them I found their customer service to be superior to Verizon. The network coverage and reliability was, from what I could tell, EXACTLY the same as Verizon. Makes sense as they are doing nothing more than subletting the Verizon network. Best of all I could have a “family plan” with multiple lines on one shared billing account. Androidwear has long been a second class citizen , especially when living on an iPhone. Hopefully this open source attempt at a watch OS can help Android watches regain lost functionality and compete with the Apple Watch. Android Wear has been on life support for a while. We’re still waiting for the miracle cure of Android Wear 2.0, but the clock is ticking, the doctors seem pre-occupied and various relatives have already given up hope as smartwatches limp ever closer to the precipice. But smartwatches may just have a new hope: a new open-source wearable platform called AsteroidOS. Network access companies, including mobile carriers, need to focus on improving network access first. Expand both the footprint and the capacity. That is the biggest issue worldwide and remains a primary issue in America. It is one of the reasons America ranks 18th in the world NOT because the current network is too slow. In my home town, one of the top 5 fastest growing cities in America for the past 4 years, the Verizon network ranges from horrid to OK. The network often drops connections or significantly reduces access to old-school CDMA (1/10th the speed of LTE) whenever tourists are in town – 8 months of the year. The access, tourists around or not, is non-existent or spotty-at-best all over town; in my neighborhood near the marsh, at the entrance to the public Shem Creek park, driving past the SCEG right-of-way as I drive to the entrance of my neighborhood, and several other locations around town. This is normal in a town that the infamous Verizon-Red-Is-Way-Better-Than-Sprint-Yellow Map shows fully bathed in Verizon red. In fact I am writing this from my home with one bar on 1x; far more common than LTE access around town. 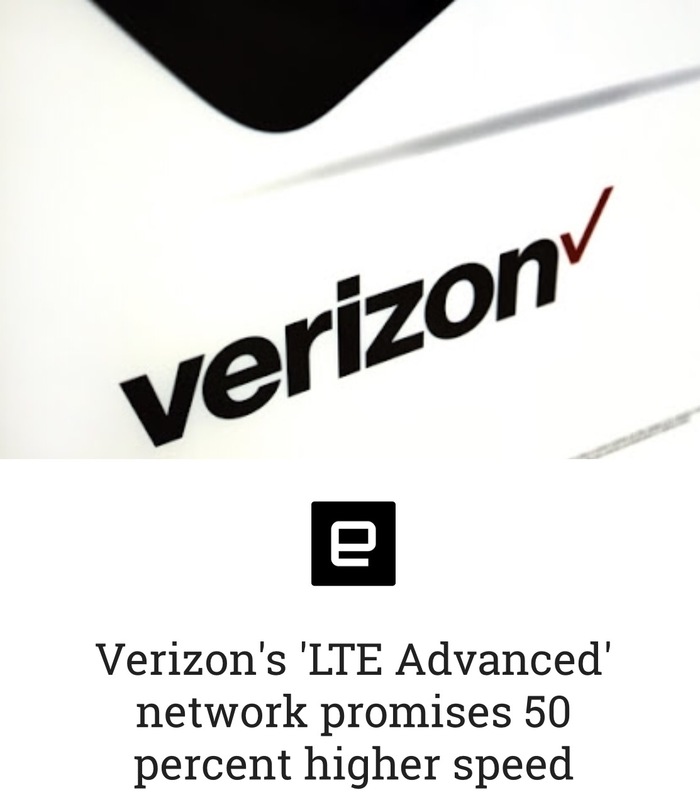 The problem is that for minimal investment in adding “LTE Advanced”, whatever that made-up tech-sounding term is supposed to be, to the existing network gets Verizon a LOT more marketing bang for the buck. Fixing the network is costly. It requires physical hardware upgrades and crews to swap out equipment. It requires buying land or access rights to put up the antennas in the right places. It requires a company with a TRUE focus on serving their customers. Making up a new term that has a good marketing vibe and tweaking your existing network software however is relatively cheap for something that will get a lot of media attention. In return the customers will suffer as fewer channels are available to serve already over-crowded networks. Marketing BS wins over true progress yet again.